Dr. Fulop’s philosophy on pet care. Home » Dr. Fulop’s philosophy on pet care. This past week at our clinic in Pickering I had a young couple, who were getting a puppy, come in wanting information about the clinic and wanting to get to know me. One question that they asked me, which I get asked a lot, was “what type of veterinary care do I give my own pets”. I think that this is a GREAT question for any person choosing a veterinarian or veterinary clinic. 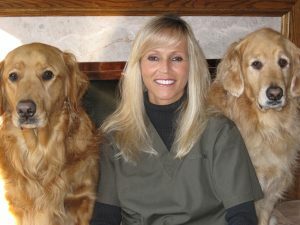 First, as a client I would want to know that the veterinarian is not recommending more than what they would do for their own pets, and second, it can give you insight into the veterinarian’s and the clinic’s veterinary medical focus. For me and our veterinary staff, we promote wellness and preventive care. In this week’s blog I thought I would answer the above question, because I think there is a lot of uncertainty among people about what type of preventive medical care they should be providing their pets over their lifetime. The veterinary care I provide my pets really reflects what I do for myself to keep myself healthy, happy, and to ward off major illnesses. For example, I have an annual physical examination, I visit my dentist twice a year, I run, and eat healthy, well relatively healthy. I do the same for my pets. In other words, the recommendations I make to clients with respect to wellness and preventive care are consistent with what I do for my pets. I don’t recommend anything I wouldn’t do for my own pets. So what do I do for my own pets? When they were puppies I made sure they were dewormed and vaccinated them at 8, 12 and 16 weeks of age. They were kept on a puppy food until 1 year of age and then switched over to an adult maintenance diet. I do an annual physical examination, which involves a thorough examination from the tip of the nose to the tail. This also includes an oral health care assessment. I do keep my dogs on heartworm prevention year round. Not just for the heartworm prevention, but more for the intestinal parasite control and flea prevention. Heartworm disease is becoming more prevalent here in Ontario because of the hurricane Katrina dogs that were brought up to us. Our winters are getting milder and mosquitoes are surviving. I do heartworm test my dogs yearly and I combine this with a Wellness Test. This not only allows me to determine if we are getting resistant strains of heartworm, but also ensures me that their heartworm prevention is protecting them. The Wellness Test allows me to monitor my pets for any underlying medical conditions, such as kidney/liver issues, Diabetes and thyroid conditions, amongst others. This gives me a baseline reading for my dogs and allows me to track or keep an eye on anything of concern. I do vaccinate my dogs on a regular basis with core vaccinations: Distemper/Hepatitis/Parvo/Parainfluenza and Rabies. There are other vaccinations like the Canine cough vaccination, Leptospirosis and Lyme that are not considered core, or must have vaccinations, but I do recommend them to those at risk. Since I work with a lot of dogs I do protect mine against the Canine Cough – this is contagious between dogs. It is recommended for dogs that go to off leash parks, the groomers, day care, obedience class or any other situation where they can come into contact with other dogs. The vaccination is like our flu-shot . They can still contract Canine Cough but it won’t be as virulent as if they were not protected. Leptospirosis is carried by wildlife. So if you have a lot of wildlife i.e. raccoons, skunks, squirrels around your area, then this is recommended. These critters will use our environment as their bathroom facility, then our pets either drink out of a stagnant pool of water, or eat contaminated soil and pick up this disease. This is a serious condition which can also be passed on to us from our pet – called zoonotic. It attacks the kidney and liver and causes failure of these organs. My Charley Girl eats anything, and because of this I protect her against Leptospirosis and therefore, so does Yukon. Lyme Disease is also becoming more prevalent. The culprit being the Ixodes Scapularis tick. So if your pets get bitten by a lot of ticks, like my poor Yukon, then this is another vaccine to consider. The same goes for cats, even if they are indoors. I don’t have a cat at home right now, but this is what I have done in the past and what I do with our clinic cats. Kittens, like puppies, should be dewormed, and then vaccinated at 8, 12 and 16 weeks of age, and then continued through their adult life. Core vaccinations include: Feline Viral Rhinotracheitis/Calicivirus/Panleukopenia and Rabies. Outdoor cats should also be protected against Feline Leukemia. 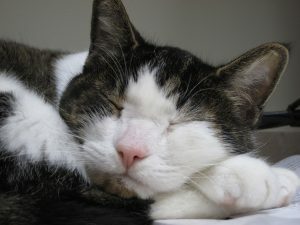 Cats can still pick up fleas and ticks and get bitten by mosquitoes so preventions are just as important for them as it is for dogs. Wellness testing is also recommended for preventive health care. This is like you and I going to our doctor for our annual physical examination. Blood work is the only true way we can assess internal health. Vaccinations may not be required every year, but an annual physical examination is highly recommended for cats – even strictly indoor cats. This allows your veterinarian to assess body condition i.e. weight and give the full tip of the nose to the tail examination including oral health care. My clinic cats are protected against intestinal parasites, fleas and are vaccinated. I also have done Wellness Testing on them to get a baseline reading of their true internal health. They also get exercised on a daily basis. 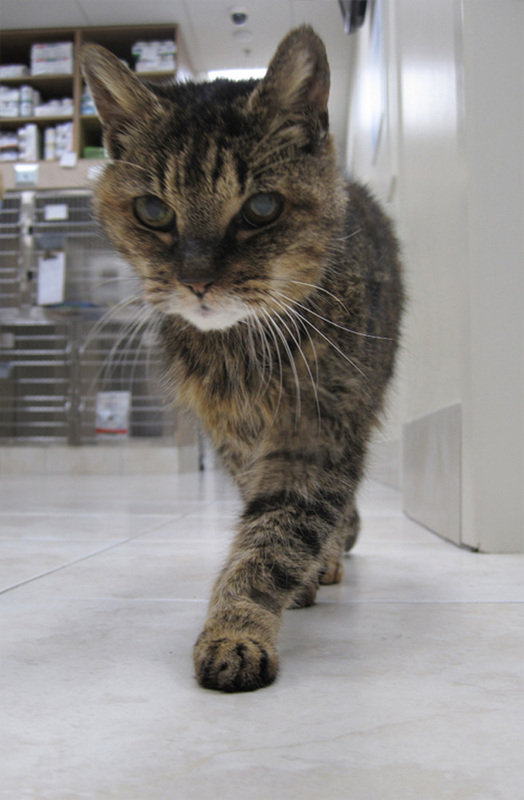 Senior pets should be examined more frequently since things can change so quickly. Seven is the “golden age” when pets are considered seniors. This may differ a little depending on the size of your pet – the smaller dog breeds tend to have a longer life expectancy so 10yrs may be considered their “golden age”. This goes for senior cats as well. Thyroid issues ie. Hyperthyroidism , and kidney disease is common in our senior cats. It is advised to monitor your pet for any changes in drinking or urinary habits. Regular visits to your veterinarian can help you provide the best care to your pets. Talk to your veterinarian if you have any questions. I hope this helps. All the best, Dr. Fulop.